There is a reason why she’s called “Mother Earth,” and it really helps to get away from a city to fully appreciate the earth we live on and the exquisite variety of life that exists on it. Growing up, I spent a good number of years living away from cities, and most (all?) of those years were without a television. Under those conditions, you invariably spend a lot of time in the woods or along the beach, or wherever you happen to be living your life, but the point being that without all the fabricated trappings of this modern life, you are allowed to reconnect with the sublime beauty and delicacy of nature. We tend to forget that we are in fact part of nature, not just an observer. These days—for me—it’s the desert. On first glimpse, the desert can seem desolate and barren, but the more time you spend there, the more you quickly realize the richness and diversity of life that lives there. Last weekend, we were out at our place in the desert, Rancho de Ardilla, with my old friend Sluggo, his lovely wife Laurian, and their two remarkable kids, Dregen and Blixa. They came down from the Bay Area for an all-too-short weekend, but it was such a nice visit, I think we’re all still jonesin’ for more. This is a wonderful time of year to make a trip out to the Mojave. All the spring flowers and cacti are in innumerable states of bloom, and much of the wildlife is emerging from their different states of their hibernation. 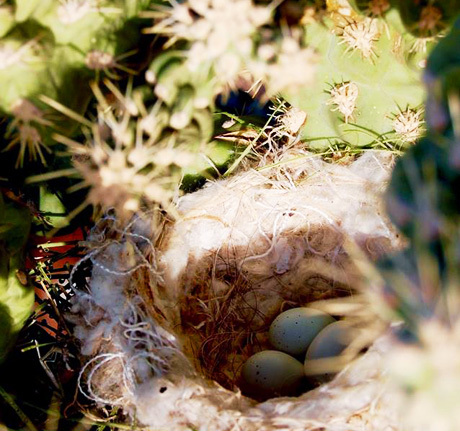 During our visit we saw a little nest built inside of a cluster of a “Jumping Cholla” cactus (Opuntia fulgida) lined with a the finest and softest of bird feathers and bits of thread, and at the bottom, three tiny little blue eggs. The mama bird is apparently able to fly effortlessly in and out, but there is no predator that could realistically navigate the treachery of this particular cactus to get to the eggs. The following morning, I went to get another peak, but the mama was keeping her babies warm and flew away as soon as I got close. I apologized and gave her space so that she could return. I am still blown away by this remarkably profound occurrence in nature. A little later that same morning, I was coming back from somewhere, and upon nearing the house, was informed that there was a snake on the porch, and with our previous experience with a snake in pretty much that same location, Patty and Laurian were keeping everybody inside. I took a quick look just to establish that it was not a rattle snake (it was not). What we had here was a beautiful (and extraordinarily long) gopher snake, very common out in that area, and good for keeping the smaller rodent population in check. 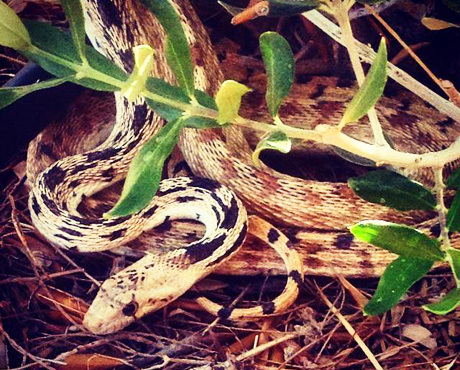 The gopher snake is in fact rather shy and wants nothing more than to be left alone. Sluggo and his family left to head back to the Bay Area, but I continued to keep tags on our little gopher snake (which by then I had begun calling “Herbert”), and eventually s/he curled up among a dense cluster of what I believe to be a Euphorbia cactus. I was watering the various trees and bushes on the property as well as giving a (smaller) drink of water to the various cacti as well. I gave a nice spray to the Euphorbia cluster and Herbert immediately lifted its head and began drinking as best it could from the water as it dribbled down along the edge of the cactus shaft. Eventually the water pooled up a bit along the base and s/he dropped her head down and was gulping as much as possible before it soaked down into the sand below. I went back and we repeated this ritual several times over the course of about twenty minutes, and I swear during that time Herbert began looking a little more filled out and vibrant. I was likely imagining this, but it was delightful watching this lovely little creature in the simple solemnity of that moment as it was drinking and quickly as was possible, because in the desert, who knows how long it might be until the next rainfall? With every visit the desert, I get closer to my sense of place on this planet, and am increasingly drawn out there as a likely place to eventually land on a more permanent basis. I like living in a city, but progressively I find a deeper connection to myself and my inner peace in a place where the simpler aspects of life are on display everywhere you look. There is something so immediately Zen about spending time in the desert, and finding my Zen self is something that I strive for each and every day. Tagged with Nature, Pantheism, Snakes, The Mojave Desert, Zen.